You may have read recently about asset allocation, and are wondering whether an investor such as yourself need to be concerned about this seemingly esoteric concept. The answer is a resounding "yes." This Financial Guide explains how to "asset allocate" properly for maximum return. How Does Asset Allocation Work? What Are the Asset Classes? How Are Asset Allocation Models Built? Asset allocationónot stock or mutual fund selection, not market timingóis generally the most important factor in determining the return on your investments. In fact, according to research which earned the Nobel Prize, asset allocation ( the types or classes of securities owned) determines approximately 90% of the return. The remaining 10% of the return is determined by which particular investments (stock, bond, mutual fund, etc.) you select and when you decide to buy them. Consequently, buying a "hot" stock or mutual fund recommended by a financial magazine or newsletter, a brokerage firm or mutual fund family, an advertisement or any other source can be downright dangerous. Tip: Recommendations in publications may be out-of-date, having been prepared several months prior to the publication date. As for market timingóthat is, moving in and out of an investment or an investment class in anticipation of a rise or fall in the marketóitís been proven that the modern market cannot be timed. Market timing strategies, such as moving your money into stocks when the market is rising or out of stocks when itís falling, just do not work. Asset allocation is the cornerstone of good investing. Each investment must be part of an overall asset allocation plan. And this plan must not be generic (one-size-fits-all), but rather must be tailored to your specific needs. Sound financial advice from a trusted and competent advisor is very important as the investment world is populated by many "advisors" who either are unqualified or don't have your best interests at heart. Determine your financial profile, based on your time horizon, risk tolerance, goals and financial situation. For more sophisticated investment analysis, this profile should be translated into a graph or curve by a computer program. Itís important to use a good computer program because of the complexity of the task. Find the right mix of "asset classes" for your portfolio. The asset classes should balance each other in a way that will give the best return for the degree of risk you are willing to take. Using computer programs, financial advisors can determine the proper mix of assets for your financial profile. Over time, the ideal allocation for you will not remain the same; it will change as your situation changes or in response to changes in market conditions. Choose investments from each class, based on performance and costs. These concepts are discussed further in the following sections. Note: If the discussion that follows seems theoretical, keep in mind that increasing your investment return by only 2% ó with no increase in risk ñ can amount to a $94,000 increase in the value of a $100,000 portfolio ($307,000 portfolio value at 10% vs. $213,000 at 8%) at the end of 20 years. Even more dramatically, it can amount to an increase of more than $2.2 million on a $1 million investment ($5.3 million portfolio value at 10% vs. $3.1 million at 8%) at the end of 30 years. Is this type of reward worth making the effort to polish your investment approach? The difference in total return, based largely on investing wisely and following the proper principles, can often mean the difference between a comfortable retirement and struggling to survive. Asset allocation is based on the proven theory that the type or class of security you own is much more important than the particular security itself. Asset allocation is a way to control risk in your portfolio. The risk is controlled because the six or seven asset classes in the well-balanced portfolio will react differently to changes in market conditions such as inflation, rising or falling interest rates, market sectors coming into or falling out of favor, a recession, etc. Asset allocation should not be confused with simple diversification. Suppose you diversify by owning 100 or even 1,000 different stocks. You really havenít done anything to control risk in your portfolio if those 1,000 stocks all come from only one or two different asset classesósay, blue chip stocks (which usually fall into the category known as large-capitalization, or large-cap, stocks) and mid-cap stocks. Those classes will often react to market conditions in a similar wayóthey will generally all either go up or down after a given market event. This is known as "correlation." Similarly, many investors make the mistake of building a portfolio of various top-performing growth funds, perhaps thinking that even if one goes down, one or two others will continue to perform well. The problem here is that growth funds are highly correlatedóthey tend to move in the same direction in response to a given market force. Thus, whether you own two or 20 growth funds, they will tend to react in the same way. Not only does it lower risk, but asset allocation maximizes returns over a period of time. This is because the proper blend of six or seven asset classes will allow you to benefit from the returns in all of those classes. Asset allocation planning can range from the relatively simple to the complex. It can range from generic recommendations that have no relevance to your specific needs (dangerous) to recommendations based on sophisticated computer techniques (very reliable although far from perfect). Between these extremes, it can include recommendations based only on your time horizon (still risky) or on your time horizon adjusted for your risk tolerance (less risky) or any combination of factors. Tip: A number of mutual fund families, brokerage firms and financial service companies offer computerized asset allocation analysis. Unfortunately, many of them, in recommending a specific portfolio of mutual funds or stocks, include only funds in their family (in the case of fund families) or those on which they receive the highest commissions (in the other cases). However, these may not be the best-performing investments. Donít undercut the benefit of a sophisticated asset allocation analysis by allowing yourself to be steered into funds or stocks that are based on biased recommendations. Your investment time horizon (mainly, your age and retirement objectives). Your financial situation (your wealth, income, expenses, tax bracket, liquidity needs, etc.). Your goals (the financial goals you and your family want to achieve). The goal of the computer analysis is to determine the best blend of asset classes, in the right percentages, that will match your particular financial profile. At this point, the "efficient frontier" concept comes into play. It may sound complex, but it is a key to investment success. More: For an in-depth discussion of this important concept, see The Efficient Frontier. Equity Funds: The style of an equity fund is a combination of both (1) the fund's particular investment methodology (growth-oriented, value-oriented or a blend of the two) and (2) the size of the companies in which it invests (large, medium and small). Combining these two variables ñ investment methodology and company size ó offers a broad view of a fund's holdings and risk level. Thus, for equity funds, there are nine possible style combinations, ranging from large capitalization/value for the safest funds to small capitalization/growth for the riskiest. Fixed Income Funds: The style of a domestic or international fixed-income fund is to focus on the two pillars of fixed-income performance ó interest-rate sensitivity (based on maturity) and credit quality. Thus, fixed-income funds are split into three maturity groups (short-term, intermediate-term, and long-term) and three credit-quality groups (high, medium and low). These groupings display a portfolio's effective maturity and credit quality to provide an overall representation of the fund's risk, given the length and quality of bonds in its portfolio. Simply stated, financial advisors build asset allocation models by (1) taking historic market data on classes of securities, individual securities, interest rates and various market conditions; (2) applying projections of future economic conditions and other relevant factors; (3) analyzing, comparing and weighting the data with computer programs; and (4) further analyzing the data to create model portfolios. Expected return. This is an estimate of what the asset class will earn in the futureóboth income and capital gainóbased on both historical performance and economic projections. Risk. This is measured by looking to the asset classís past performance. If an investmentís returns are volatile (vary widely from year to year), it is considered high-risk. Correlation. Correlation is determined by viewing the extent it which asset classes tend to rise and fall together. If there is a high correlation, a decision to invest in these asset classes increases risk. The correct asset mix will have a low correlation among asset classes. Correlation coefficients are calculated by looking back over the historical performance of the asset classes being compared. Tip: The ideal asset allocation model for you will change over time, due to changes in your portfolio, market conditions and your individual circumstances. There will probably be shifts in the percentages allocated to asset classes, and possibly some changes in the asset classes themselves. Itís important to be informed about asset allocation so as to avoid the "cookie cutter" approach that many investors end up accepting. Many of the asset allocations performed today take this "one size fits all" approach. There are all sorts of investment recommendations continually flowing from the financial press. The key question is: Are they suitable for you? Regardless of the approach you take, be sure that an asset allocation takes into account your financial profile to the extent feasible. The "efficient frontier" concept is a key to investment success. A graph demonstrating the efficient frontier is shown below. Any expected return (left side of graph) carries with it an expected risk (bottom of graph). This risk-reward relationship varies from individual to individual. Conservative investors cannot tolerate more than a low level of risk, and are willing to accept a return commensurate with that level of risk. More aggressive investors are willing to tolerate higher levels of risk in the expectation of higher returns. 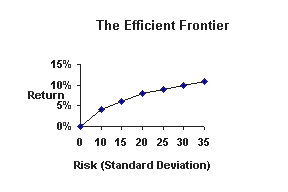 The efficient frontier is a line on the graph that represents a series of optimal risk-return relationships. That is, every dot on the line represents the highest return for a given level of risk or, stated conversely, the lowest risk for a given rate of return. Conservative investors will aim for a spot on the left side of the efficient frontier (low return, low risk) while aggressive investors will aim for the right side (high return, high risk). If your portfolio (present or proposed) falls on the efficient frontier line, it has an optimal risk-return relationship, but nonetheless still may not be suitable for you because it may be too aggressive or too conservative. Your portfolio should be at that spot on the efficient frontier that approximates your particular risk-return goal. Note: The efficient frontier is the result of mathematical calculations of expected risk and return. Risk is shown in levels of standard deviation, a commonly used measure of volatility. As shown on the graph, if you are willing to tolerate an expected risk (standard deviation) of, say, 12, then you can reasonably (not definitely) expect an approximate return of 10% over a period of time (Portfolio C) ó if your portfolio is efficient. It is unlikely, over time, that returns will be higher than those shown on the efficient frontier. Of course, you may, in specific instances, achieve a higher return than that shown, but your average return over time will generally not exceed the amount shown. If your portfolio falls below the efficient frontier, then it is "inefficient" in that it exposes you to too much risk for the specified return or, conversely, provides too low a return for the specified risk. Unfortunately for investors, most portfolios fall substantially below the efficient frontier. Example: Portfolio A represents an inefficient portfolio in that it falls below the efficient frontier, meaning that the investor might reasonably expect a return of 10% for a risk of 25. However, if the investor is comfortable with that risk level, he can theoretically increase his return to 12% with no increase in risk by making his portfolio efficient (i.e., modifying it to resemble Portfolio B, which is on the efficient frontier). Conversely, if he wants to lower his risk, he can maintain the 10% return while reducing the risk to12 (by modifying his portfolio to resemble Portfolio C on the efficient frontier). Portfolio D is also efficient (as are B and C, all on the efficient frontier), but represents a portfolio that will enjoy a lower return with lower risk.